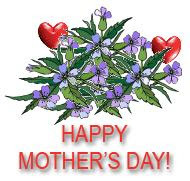 Here's to all the MOM'S out there... I hope you have a WONDERFUL DAY!!!! HI, I just happened to find your site, and I think I'm in love, have been trying to think what to give friends at church this year for Christmas. DISHCLOTHS, WONDERFUL DISHCLOTHS. Thank-you so much for sharing! Question, am having difficuly printing your patterns, any idea what I'm doing wrong. P.S Love the Ducky illusion scarf. Our church has a "rubber" duck race every year at a pool. It has been a wonderful fund raiser, but the girl, Katie, works so hard getting it together, am going to ue your pattern to make her that special scarf.